Citrix HDX SoC finally the Thinclient becomes Thin again! In this blog we are going to take a closer look at the SoC architecture, and I will tell you why I think this is going to change the Thinclient industry. 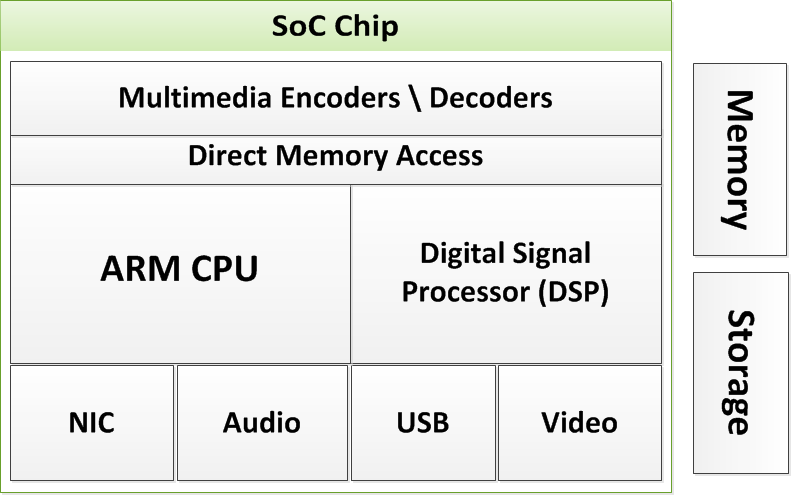 A system on a chip (SoC) is an integrated circuit that integrates all components of a computer or other electronic system into a single chip. 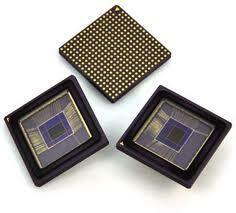 This Single Chip contains both hardware and software components. The last one is for controlling hardware components inside the SoC. Please note that the Citrix Receiver software isn’t part of this software, this software contains codecs and other controlling software bound to the SoC itself. As you can see there is a lot of stuff in the Chip, you can almost say that basically everything you need is on this Chip, only memory and storage are external from the chip. This single chip approach is also taken by many other devices such as phones and tablets. 3: If the API’s are in place, Citrix Receiver will use the components inside the SoC and start offloading image processing to the DSP for example. 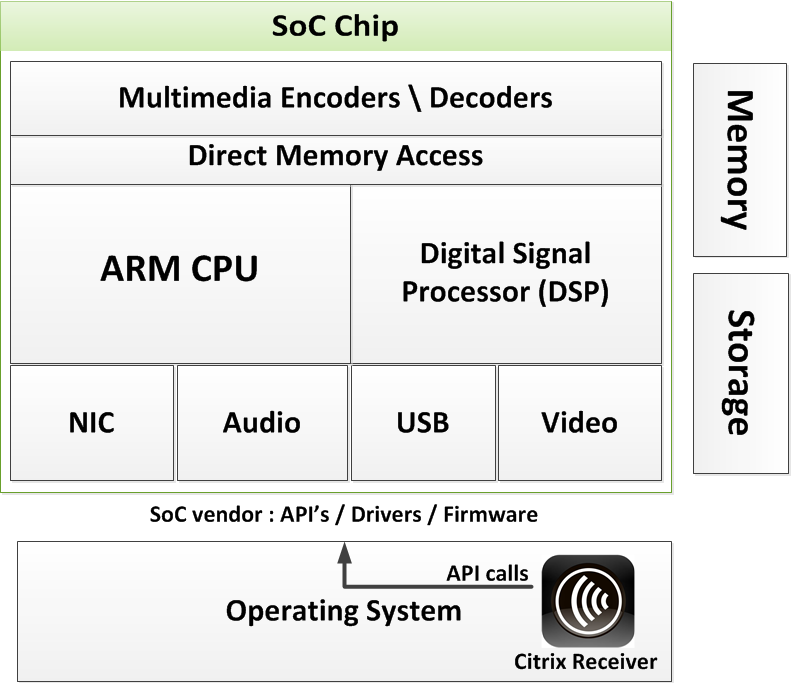 While Citrix started the SoC initiative with a few chip manufacturers, the SoC isn’t reserved for use with Citrix HDX only, Thinclient vendors also support other remoting protocols on Thinclients with the SoC on board, for example RemoteFX can leverage the DSP as well. Now this combination is interesting, because you might think that RemoteFX features only works on windows clients with an supported version of RDP. Since this SoC consists of an ARM CPU and is Linux based you would not expect RemoteFX features there. Well this is done through the open source RDP client named FreeRDP. FreeRDP can leverage the DSP to offload image processing as well. Please note that FreeRDP currently only supports RDP 7 in combination with Win7\2008R2, there is no support for the new Remote FX features in RDP 8 (Win8\2012) yet. There is also no official statement that Microsoft is going to support FreeRDP with the new features in RemoteFX. The first HDX SoC is coming with an ARM based CPU, this means no support for Windows Embedded, also Citrix Receiver for Linux is the only client from Citrix that supports the SoC initially. The x86 based HDX SoC will follow later, as you might know Microsoft will release an ARM based version of Windows 8 (Windows RT). The interesting part is that there will also be a Windows Embedded 8 ARM version, this OS will be more suitable for Thinclient hardware because it’s cheaper and less power consuming. WES nowadays isn’t really made for running on cheap Thinclient hardware, it’s like a big beast in a tiny cage, it’s slow and clunky to say the least. If you are looking for a way to tame the beast you should take a look at Thinkiosk from Andrew Morgan which provides a uniform interface across all your Windows Fat and Thinclients. There is also a interesting comparison between Fat and Thinclient hardware by Kees Baggerman and Barry Schiffer which shows some interesting results and discussions. While the Linux based SoC Thinclients has much advantages regarding performance, small footprint and costs, there are some special use cases when you need Windows on your Thinclient end-point, for example when you need local printer or scanner redirection based on Windows drivers. I don’t think you need to make the decision based solely on HDX features anymore, because the most important features are covered in both versions (Windows and Linux), but there are certainly use cases that needs Windows Thinclients, my point is don’t buy them only because there is Windows on it which sounds save, but examine the use cases and mix and match! A lot of Thinclients (especially the more powerful WES variants) are almost in the same price range as a normal Fat client PC. When you are designing a VDI\SBC environment, this can be really a show stopper, because the goal on those projects is often to save money. Now with the arrival of SoC the Thinclient is finally getting “Thin” again, Thin in form factor and price but not in performance!